*Oh yeah, it’s getting’ to be about that time of the year in the NBA. Yep, it’s almost time for the playoffs, baby! As sports site Yarbarker wrote, Sunday’s game between the Boston Celtics and Miami Heat was more than just a late-season matchup between two Eastern Conference powers. The winner would be set up to avoid having to face the suddenly resurgent New York Knicks in the first round of the playoffs. So it’s no surprise that emotions between the two teams were high. 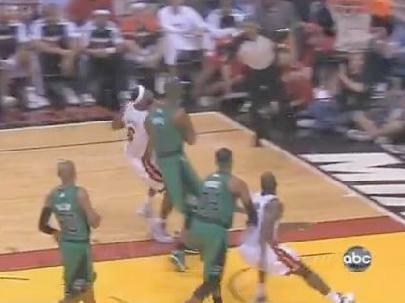 They boiled over in the second quarter when LeBron James tangled with Jermaine O’Neal. While running the break, James collided with O’Neal and fired the ball at him starting a mini-brouhaha between the sides. James finished with 27 points, seven assists and five steals as the Heat crushed the Celtics, 100-77 to grab the second seed. Maybe those stupid trade moves are catching up with the Celtics. They will be lucky to make it out of the first round.